FOXBOROUGH -King Philip knew the game’s tense final moments would end in euphoria. After all, it was playing out eerily similar to other rock fights they had encountered along the improbable streak. With less than two minutes to go, Cole Baker drilled a go-ahead 30-yard field to give King Philip a three-point lead. 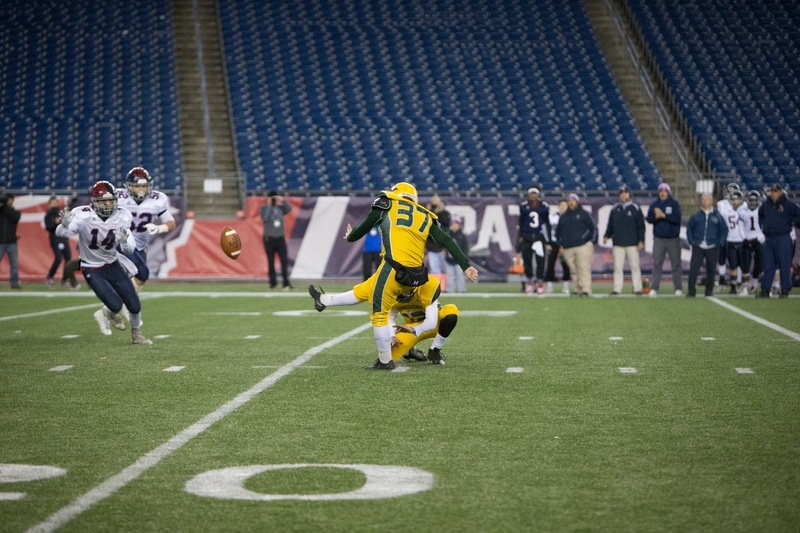 On Lincoln-Sudbury’s ensuing drive, KP’s secondary broke up a pair of passes, the last of which came courtesy of captains Shane Frommer and Andrew Dittrich, as King Philip defeated L-S, 10-7, in the Division 2 Super Bowl on Friday night at Gillette Stadium. The win gives King Philip back-to-back championships and improves their winning streak to 25 games heading into next season. Just five minutes prior to Baker’s game winning kick, the sophomore had a chance to push KP in front. 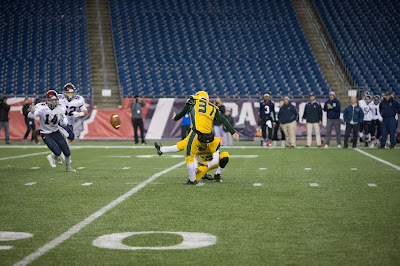 Baker’s kick, however, went wide left giving Lincoln-Sudbury a chance to win the game. As they did all season long, King Philip’s defense was ready to come up with a game changing play. Junior linebacker Jack Webster came off the edge and strip sacked Lincoln-Sudbury quarterback Braden O’Connell. Defensive Evan Rice pounced on the fumble setting KP up inside the L-S 30 yard line. Seven plays later, centered on a Frommer first down run, Baker set up and drilled the field goal that sent the Warriors to their second straight title. “I could hear L-S fans over there screaming," said Baker of the adversity. "I just let it slip my mind, though. That does not matter." Frommer, who has been at the heart of the Warriors 25-game run, played the Super Bowl with a hip pointer. That seemed to have no impact on Frommer’s play as the senior back ran for 137 yards and a touchdown. The biggest play of the game likely came from someone who did not start the game. Trailing 7-0, King Philip saw their starting quarterback Brendan Lydon head to the sidelines with a leg injury on the first drive of the second half. Backup Robert Jarest entered the game and showed almost no signs of nerves. On third and eight the sophomore drilled Thomas Madden on a fade route down the left sideline for 37 yards. Three plays later, Frommer scampered in 13 yards out to tie the game at 7-7. Early on it seemed as though Lincoln-Sudbury was going to dictate the pace of play. O’Connell led the Division 2 North champions on a 14-play, seven minute drive capped off by a Matthew Cunningham 18 yard touchdown reception to hand L-S a 7-0 lead. Defensively, meanwhile, Lincoln-Sudbury’s line looked impenetrable. The unit, highlighted by Cal Kenney and Michael Ciaffoni, held King Philip to just two first downs and 11 total plays in the first half. Kenney recovered a fumble midway through the second quarter to secure Lincoln-Sudbury’s 7-0 lead going into halftime. The second half was controlled by King Philip’s defense. Lincoln-Sudbury managed just six yards of offense and never crossed its own 40-yard line over the final 20 minutes. King Philip’s tri-captains of Frommer, Andrew Dittrich, and Jack Piller have certainly left a mark on Massachusetts high school football that won’t disappear anytime soon.